Environmental Characteristics Efficiency (EFF) Varies with type of load attached to the power source as follows: EFF = 70–90% with predominantly power supply type loads. EFF = 70% at maximum (125 V) output. EFF = 65% at nominal (120 V) output. EFF = 60% at low line (105 V) output. Ambient Temperature 0 to 55°C Operating. –40° to 85°C Nonoperating. Humidity 0–95% relative humidity, noncondensating. Cooling Self contained fans provide forced air cooling. All air inlets are filtered. Filters are replaceable and reusable. Heat Dissipation If system location is to be air conditioned, allow 800 BTU/hour per kVA for a typical electronic load (higher for mixed or linear loads). NOTE: One ton of cooling = 12,000 BTU/hour. Ventilation required to maintain less than a 10°C rise in the ambient temperature for a typical electronic load: 390-G – approximately 600 CFM. Input/Output Service Connections Input and output connections are made via a heavy duty terminal block mounted inside NEMA-approved junction boxes that are located on the lower rear panel of the mainframe. Allow an additional 3.25˝ to overall depth for junction box clearance, or 5.25˝ when “T” output option is specified. Mechanical Specifications Dimensions A. Height w/caster base B. Height w/forklift base C. Width D. Depth Each G Series mainframe is provided on a caster base with leveling feet for ease of installation. Forklift or shock mount base is optionally available. Consult the factory for details. Solid State AC Power Conversion • Programmable AC test power, 45 to 5,000 Hz. • Power line susceptibility tests: spike, sag, surge. • Flexible, expandable lab power. • Precision frequency conversion. • High reliability UPS. 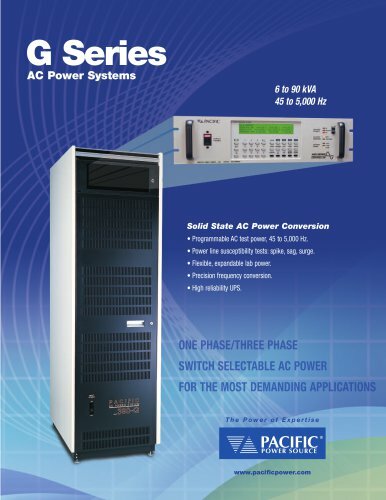 The Leader in Power Technology As a privately held, leading manufacturer of high-quality AC Power Conversion Equipment, Pacific Power Source, Inc. offers standard catalog products that range in power from 500 VA to >625 kVA. Low-power products include line conditioners, frequency converters and Programmable AC Power Sources. High-power systems include programmable power test equipment, power line conditioners, frequency converters and uninterruptible AC Power Sources. Founded in 1971, the Irvine, California, company was an early pioneer in the development of linear solid-state power conversion for use in high-reliability applications. The company now manufactures both advanced linear and broadband switching types of AC Power Sources. For Application Engineering Assistance Contact the factory directly Consult your local PPS Representative 17692 Fitch, Irvine, CA 92614 USA Call direct: +1 949-251-1800 • Fax: +1 949-756-0756 US: 800-854-2433 E-mail: sales@pacificpower.com • www.pacificpower.com © 2008 Pacific Power Source, Inc. Subject to change without notice.